Fr. 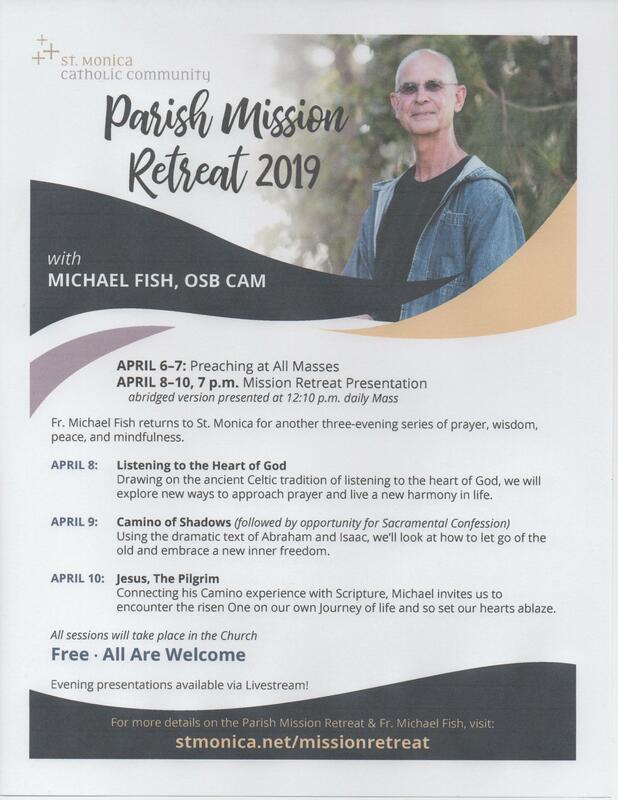 Michael Fish returns to St. Monica for another three-evening series of prayer, wisdom, peace, and mindfulness. Fr. Fish will be preaching at all Masses April 6 & 7. April 8-10, 7:00 pm Fr. Fish will give the parish mission presentation in the church. If you cannot make the evening presentation, Fr. Fish will be giving an abridged version at the daily 12:10 Mass. Michael Fish is a Camaldolese monk and a member of the New Camaldoli Hermitage in Big Sur California. Michael has been granted permission to transfer his stability to his Santa Cruz home, now an official “Camaldolese Residence” – St. Romuald’s Hermitage. While remaining under the authority of the Prior, Michael is now a separate, self-supporting “mini-monastery.” This is a blessing for him as he maintains his ties to New Camaldoli while continuing to explore solitude and itinerancy as another expression of Camaldolese life and mission. Solitude is only part of his calling and he offers retreats, talks and spiritual direction to religious, parochial and lay communities. Michael, with the assistance of contemporary writing and teachers, continues to develop the notion of “the inner monk”, “the hermit in the world” and how to live a monastic rhythm in the world.